Burnishers are floor machines used to get shining floors also called ‘wet look’. Floor burnishers are available as both walk behind and sit-on machines. The advancing technologies have made the machines more reliable, efficient and close towards automation. Robotic floor burnishers have been manufactured though they are not so in common like other floor cleaning machines. Advanced technologies and urge for cleanliness are driving the growth of the market. 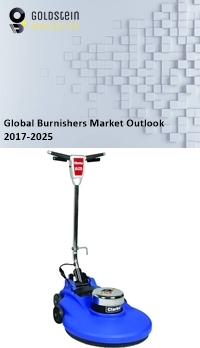 Goldstein Research analyst forecast that the global floor burnishers market is expected to grow at a CAGR of 3.8% during 2017-2025. The era of urbanization and mechanization are impacting the sales and demand of the floor burnishers all over the world. The newly constructed spaces and spaces for renovation are the major end-users of the floor burnishers to get high gloss results that last for several years. Further, as compared to traditional floor buffers, floor burnishers have the upper hand for its high speed, accuracy, dust control and lower maintenance requirement. On the other hand, growth in the supply and shipment of floor burnishers is largely dependent upon the government expenditure over the public spaces maintenance, as the burnishers are primarily used at the large spaces such as hospitals, airports, and others maintained by the government authorities. Walk-behind floor burnishers segment accounted for the largest market share of 49.6% in 2017, followed by sit-on floor burnishers and robotic floor burnishers market share. Over the forecast period, robotic floor burnishers are expected to exponentially increase their market share growing at a CAGR of 9.7%. Based on geography, North America region harnessed largest revenue share of 35.8% in 2017 of the global floor burnishers market on the back of high penetration among the renovation companies to renovate residential and commercial spaces and moreover the increasing number of commercial spaces on the back of new construction has increased the demand for floor burnishers. North America is closely followed by Europe and APAC. APAC region is expected to grow at a CAGR of 6.2% over the forecast period due to huge construction and restoration activities undergoing in the region. The report covers the present ground scenario and the future growth prospects of the floor burnishers market for 2017-2025 along with the market players’ analysis. We calculated the market size and revenue share on the basis of revenue generated from major players in the Global region. Global Floor Burnishers Market Outlook 2017-2025, has been prepared based on an in-depth market analysis from farm market experts. The report covers the competitive landscape and current position of major players in the Global floor burnishers market space. The report also includes Porter's five force model, SWOT analysis, company profiling, business strategies of market players and their business models. “Global Floor Burnishers Market Report” also recognizes value chain analysis to understand the cost differentiation, pricing models to provide a competitive advantage to the existing and new entry players. Our Global floor burnishers market report comprises of the following companies as the key players: 3M, Nilfisk Group, Tennant Company, Powr-FLite, Mytee Products, Inc., Electrolux, Tornado Group, Kenroy Home, Tornado Group, Oreck Commercial, CleanFreak, etc.